According to ayurvedic materia medica, Jeera is pungent in taste and is light, dry, sharp and hot in effect. It pacifies 'vata' and 'kapha' in the body but aggravates 'pitta'. Its chemical constitution mainly consists of a volatile oil, which is responsible for its peculiar smell and taste. Jeera also contains many important nutrients like proteins, carbohydrates and traces of minerals such as calcium, phosphorus and iron in different proportions. Though Jeera has been known for various medicinal properties affecting different systems of the body, its main area of action essentially seems to be the gastrointestinal tract. Apart from having the marked carminative and digestive effects, jeera is also a wind repellent, anti colic and intestinal absorbent agent. Due to the vast range of its effect on human body, jeera acts as an anti obesity, anti-inflammatory, blood purifier, diuretic, galactogouge (that enhance milk engendering during lactation) and uterine stimulant. Some ancient tests described it as 'katu poshtic' meaning a bitter tonic. Use of Jeera is so common in ayurveda that its application finds mention in the treatment of many diseases. It is given in conditions where patient complains of anorexia, nausea, indigestion, distension of the abdomen, colic pains, sprue, piles and intestinal worms. 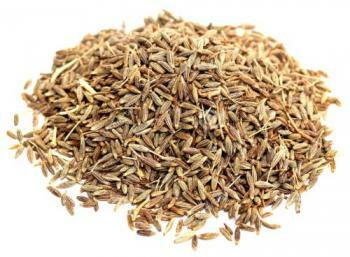 Jeera helps treat urinary stasis, prevents stone formation and has a number of benefits when applied externally. As a household remedy, jeera is a favourite of Indian grannies. Here are a few tips to gain its medicinal benefits in our day to day life. 1. As a single herb, jeera is best used in roasted form. Taking a pinch of roasted and crushed jeera shortly before meals, enhances appetite whereas if used after food, it helps in faster digestion. To allay severe or chronic indigestion, hiccup and abdominal distention crush jeera, ajwain, black pepper, rock salt and small harar in equal parts. This 'Jeerakadi Churna' if taken in a daily dose of one to two gm twice a day, with warm water or whenever required, is simple and safe remedy to get the abdominal wind dispelled and to gain symptomatic relief from colic pain. 2. Jeera is also a very good medicine for mucous diarrhoea and non specific colitis. It used in combination with other medicines to cure irritable bowel syndrome. As a simple and safe remedy, by crushing 50 gm of it with an equal quantity of each of nagarmotha, sonth and kutaja bark and 250 gm pulp of bael and taking two gm of this powder two or three times a day helps in binding and clearing the stool. 3. Decoction of Jeera and dry dhania helps to cure vomiting and loss of appetite occurring during pregnancy. Half teaspoonful of crushed combination of roasted jeera 100 gm, table salt 50 gm, black pepper 30 gm can be mixed in a small bowl of curd to make it more digestible. 4. As a delicacy and appetizer, there is a common practice to serve jeera water before meals. It is available at many eateries, but to overcome the risk of contamination and infection, it is better to make this gastronomic and digestive recipe at home. Take two tablespoonful of each of roasted jeera powder and lemon juice, one table spoonful each of pounded mint leaves, dry mango powder called 'amchur', table salt, fifty grams of sugar, half teaspoonful of black salt and black pepper and a pinch of hing. Make about five to seven glasses of jeera water. Besides waking up the taste buds and enhancing the gastric secretions, 'jal jeera' also makes a freshening summer drink. Ayurveda has a large number of classic medicines where jeera is used as an important ingredient. To name only two, jeerkadyarishta and hingwashtak churna are the most famous digestive medicines. Apart from the jeera used in Indian kitchen, which is known as 'safed' (white) jeera, there is another variety called black jeera. It grows on high altitudes and is costlier than the former. Though considered a separate herb, black jeera has more or less same medicinal properties as that of the common white jeera. Jeera is a valued spice in India. It has many medical benefits in digestive conditions due to the presence of organic compounds in it. Jeera helps in stimulating the glands that secrete bile, enzymes and acid which are responsible for complete digestion of food.